I recently had a communication from an extension colleague in Washington state who has a client that asked a question about ventilating a green house. The client wants to convert their back porch to a greenhouse using polycarbonate to enclose the structure. The greenhouse will be on the south side of the home. It will not get any direct sun in the summer from directly above. Some direct sun in the winter. The question regarded what kind of ventilation would be needed. 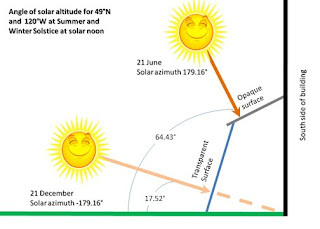 The client also wants to know the angle of the sun in the summer and winter for his latitude (about 49°N). For venting a backporch to a greenhouse, there are many issues to consider. First, for winter ventilation one can use the greenhouse as a solar accumulator during daylight hours. To do this, install a small fan that will draw air from the greenhouse and direct it into the home. A bathroom fan may work for this application. Choose one of the more quite ones. To get the appropriate size, calcuate the greenhouse volume and calcuate your fan size (cfm) to equal about eight air exchanges per minute. For a 10-ft x 20-ft x 8-ft or 1,600 cu. ft. Then divide 1,600 cu. ft. by 7.5, which gives a resulting fan requirement of 213.33 cfm. Bathroom fans are typically rated between 50 and 150 cfm. So two mid-size fans would work in this example. Rembember to install a return air vent as well. Place the fans high to move the warm air from the greenhouse into the home and the return air vent near the floor to pull cooler air from the home. For summer ventilation, it would be best to engineer some sort of venting mechanism near the peak. There are many different means to do this creatively. Otherwise, you could install a pair of exhaust fans near the peak of the greenhouse on either end. Plan on about one air exchange per minute in this instance, which will require a totoal of 1,600 cfm or 800 cfm per fan. You will then need to add ventilation openings allowing outside air to come into the greenhouse when the fans are in operation. When designing a lean-to style greenhouse for the southern exposure, it is wise to place a opaque surface overhead that will shade summer sun and the transparent surface should be perpendicular to the winter sun. The image below should better illustrate this concept.